Bamberg, South Carolina (October 2018) – On October 12, 2018, South Carolina National Guard presented Bamberg County Emergency Management staff with a Certificate of Appreciation. 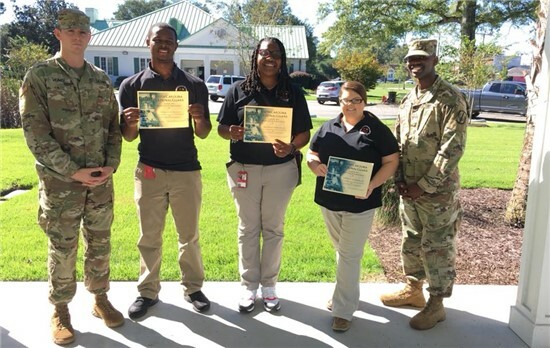 SC National Guard Second Lieutenants Micah Weaver and Tre Bowman presented Brittany Barnwell, Director, Tiffany Kemmerlin, Administrative Assistant, and Taurean Washington, Addressing Technician, with Certificates of Appreciation for their work during Hurricane Florence. The Bamberg County Emergency Management staff were individually recognized for their support and dedication during the response efforts for Hurricane Florence. Second Lieutenants Weaver and Bowman spent several days assisting Bamberg County during Hurricane Florence. Weaver and Bowman proved to be valuable assets to the Emergency Management department throughout the storm, often staffing the Emergency Operations Center overnight. Weaver and Bowman also coordinated efforts between Bamberg County and the SC National Guard. Bamberg County Emergency Management is responsible for coordination and operation of a county-wide, multi-hazard disaster preparedness program and helps to prevent the loss of life and property damage throughout Bamberg County attributable during storm events. The department frequently posts updates on its Facebook page www.facebook.com/BambergCountyEmergencyServices/.